I have always been a perfectionist, aiming to reach something that is impossible, because the moment you get to be perfect you’re predictable, which equals boring, which is not perfect anymore… But still, aiming for perfection gets the best out of ourselves, such as I see it. And today we had a superb example of this in Daniil Trifonov‘s performance at the Royal Festival Hall. Two things happened last minute: he decided to replace Beethoven’s sonata for Rachmaninov’s Variations on a Theme of Chopin, and the man next to me commanded me to have my leg still for the concert. The latter obviously affected my concentration at the beginning, preventing me to enjoy fully the beginning of Bach-Liszt’s Fantasia and fugue in G minor. The Fantasia’s tribulation mingled though with my unrest, and so I reached the Fugue in a somehow tense position. I think that was just a gift: the delicacy with which Trifonov stated each one of the themes, offering redemption for all the earlier obscurity, got me totally back into the concert. I enjoyed a lot for the first time Bach on the piano (I can’t possibly count Gould in because he cheats –using his voice he gets me every time). 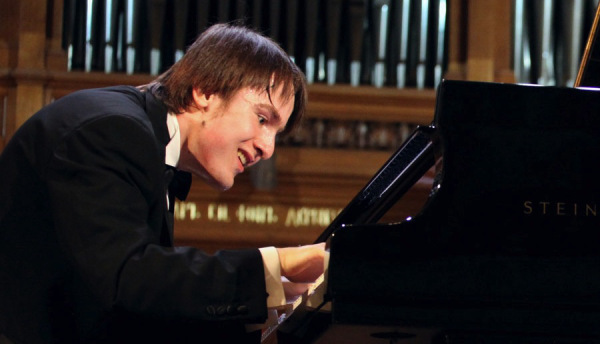 This Russian prodigy draws every line with a distinct thickness, making the Fugue’s complexity transparent to us. The programme change was a very wise decision. The variations linked perfectly the Fugue (through the reminiscence in the I. Moderato) and Liszt’s études. Trifonov offered a masterclass sketching each variation with its own character, measuring with great taste the progressions between them to provide the work with uniformity. In XIII. Largo he presented us with a unique moment: the performance of those octaves turned the piano into a new instrument for some seconds… such is his command. We were thrilled by then to hear Liszt’s Twelve Trascendental Études, where he could show all the fireworks he’s capable of. The speed of his fingers, spraying all over the keyboard; the natural musicality of his organic rubato; the beauty of his crisp pianos; the power of his fortissimos… and still some more sounds out of this world like that development on the low register that seemed to grow and grow forever… The pianist offered us his full palette of colours, he took risks and managed to achieve amazing things, only losing his concentration in a couple of occasions -and by turning an imperfect human again, he showed the great difficulty he was facing each second. From the whole set, no. 9 “Ricordanza” was my favorite for its simple, direct beauty. Debussy’s encore, Reflets dans l’eau from Images, just rounded up the legend of this 22-year-old piano master who no doubt will provide us with many more enjoyable moments. He’s already a great artist who uses the piano keyboard to paint all kind of pictures for us. Just judge by yourselves and don’t miss his next concert!